size-18 files, and had to use a leader with a 6X tippet. Any size larger than that would be noticeable to the trout. Later on that day, though, I switched to larger fliesa No. 6 2X longbecause I began fishing deeper, darker sections of water, and was able to use a leader with a 2X tippet. As a rule, you should use the heaviest tippet you can get away withwithin reason. If the line seems too obvious, or if you're not catching fish, go to a smaller size. Dries can also be fished downstream to rises and "twitched" to entice a strike—or ■'skated" across the surface. Before rruxiern manufacturing techniques made it possible to taper monofilament nil leaders were made of separate J tilths of line, knotted together in order of decreasing strength: OX, IX, 2X, and so on. This made leader construction a bit of a time-consuming process, not to mention the matter of buy trig many spools of various pound-test lines. However, there is still one major advantage that knotted leaders have over knotless: They last longer. Because you lose a bit of line every time you cut off one fly and Lie on another, your knotless 4X leader, say, will eventually become a 3X, then a 2X, then a IX, and so on, not to mention the fact that it will decrease in length. With a knotted leader, it's a simple matter to tie a new length of 4X tippet material onto the end. And you can niake a SX leader out of a 4X in the same manner. While it is possible to tie tippet miiteriiil onto a knotless leader, it's difficult to determine the exact diameter of the break-off point and match the right tippet materia! to continue a perfect taper, TTiis is why leader manufacturers still offer knotted leaders. Choose your fly line weight before you choose a rod and reel. A 6-weight, floating, double-taper line is a good all-around choice for the beginner. Don't scrimp on line quality. Pick a fly rod that matches the weight of your line. An 8^-foot, moderate-action rod is average. Try casting a number of rod sizes and styles before purchase. 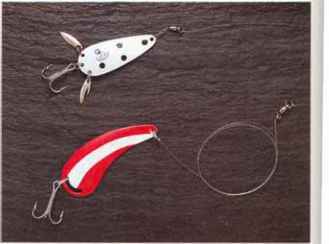 Use a single-action reel for panfish and trout; a multiplier reel for bass, northern pike, and other large fish. Leaders are tied onto the end of the fly line. The tip of the leader, or tippet, takes the fly. Its diameter is classified according to an X-rating: The higher the X number, the finer the tippet.